Rita Ora made her first ‘Fifty Shades Freed’ red carpet appearance for the Paris premiere this evening (February 6) in France. 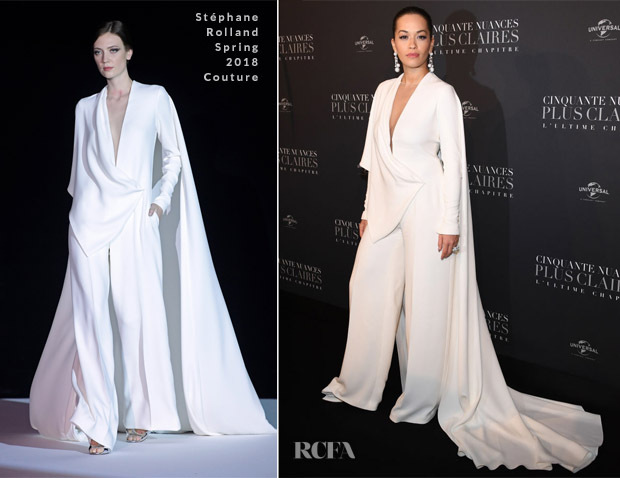 When I saw her in this Stéphane Rolland Spring 2018 Couture draped white suit, my thoughts were you would fall into three camps. 1. This is the most effortless she has looked on the red carpet. 2. You expected more as Rita often goes bolder for big events. 3. You wish she had hemmed those trousers. I personally love the elegance of it all. This is a spotlight sharing look. Oozing with plenty of style and panache. Even though the trousers are making me itch. de Grisogono jewels completed her look. Update: From the additional pictures I’ve added below, it appears that Rita wasn’t standing straight in the first photo, as the trousers were in fact perfectly tailored.